The bark is out among the young canines of the North Shore and Auckland that Pet and Vet Puppy training classes are the place to be! The whisper is that these classes are also the perfect place to get their human carers well trained in the best in canine care. And even more exciting – it is an ideal place to pick up a classy playmate – woof! Pet & Vet has weekly puppy training classes, which are run by Rayne Paul. The sooner you start training (that’s you as well as your puppy!) the better: Get your toilet training on track from day one; know what to expect and how to teach your newest family member how to be a polite and enjoyable canine citizen; make sure you don’t create bad habits that are hard to correct later. Pups benefit most from these classes between 8-16 weeks of age. In fact the earlier they participate in puppy socialization the better! The classes have a strong emphasis on owner education and canine behavior, as well as basic obedience and handling. Attendees also receive a comprehensive handbook. Health matters – household poisons, choking, bloating etc. So if you’re looking for puppy or dog training classes in Auckland or the North Shore, please call us on 489 6263 to reserve a place in what may well be the most important thing you do to enjoy a happy life with your new pup. Rayne has been taking puppy classes at Pet and Vet for more than four years. He has worked closely with qualified animal behaviourists and trainers, and is committed to providing a safe and rewarding environment in which owners can help their puppies grow and develop into great canine citizens. 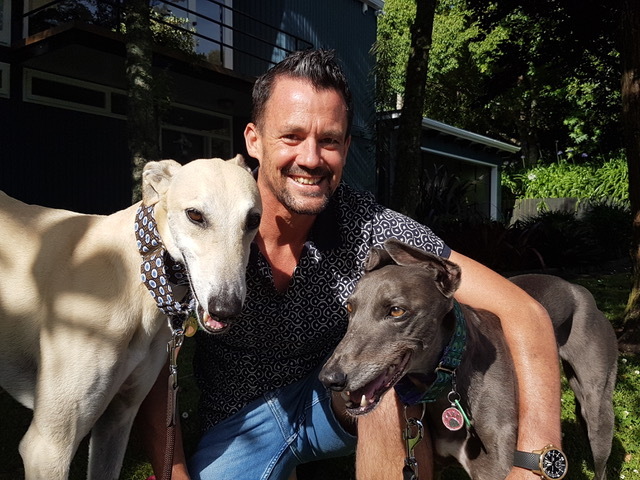 Rayne has also worked closely with the Greyhound Adoption Programme, fostering ex-racing greyhounds to help them make the transition to pet life. Helping adult greyhounds learn to live in a house for the first time highlights the benefit of good socialisation at an early age. Dogs that have not had wide and varied positive experiences as puppies are more likely to be fearful, and struggle to cope with the many new experiences required of a pet dog. The focus of Rayne’s approach to puppy training is to concentrate on showing puppies what you want, and rewarding them when they get it right. Puppies learn incredibly fast via positive reinforcement, and using this method helps develop a strong and positive bond between the puppy and their humans. The puppy classes provide an opportunity for puppies to mix with other puppies of different breeds, as well as other humans, in a safe supervised environment. It also provides the humans with opportunities to refresh or develop their puppy handling skills, and to help teach the puppies some essential cues, such as coming when called, sit, lie down, stay, and walking on a loose lead. If you’re keen, Rayne also loves to teach a few fun cues like roll-over, shake and high-five! Rayne believes in having fun with your puppy, and developing a shared language that will set you up for a long and happy life together. He lives in Castor Bay with his wife Catherine, and their two ex-racing greyhounds Mitch and Sky. Please call us on (09) 489 6263 if you would like to join Rayne's classes or have any questions.